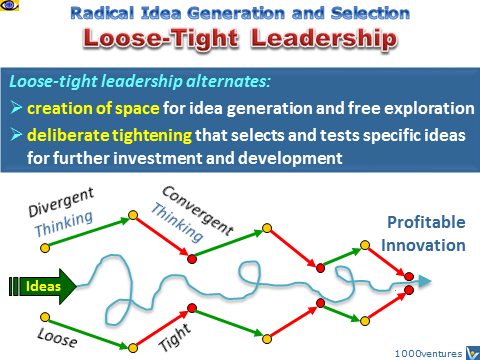 Loose-tight leadership alternates the creation of space for idea generation with a deliberate tightening that selects and tests specific ideas for further development. Looseness usually dominates the early stages of the innovation process; in the later stages, tightening becomes more important to scrutinize the concepts and bring the selected ones to the market. A balanced approach is essential to loose-tight leadership. Those who remain loose too long generate plenty of ideas but have difficulty commercializing them. Those who lock into the tight mode choke off all but most obvious ideas, thus confining innovation to incremental line extensions of existing products that add little value.